A payment plan is used to charge your customers at specified intervals with them only having to input their card details once. The remaining subsequent charges are handled automatically by Rave. The payment plans page shows all the payment plans created on your Rave account. 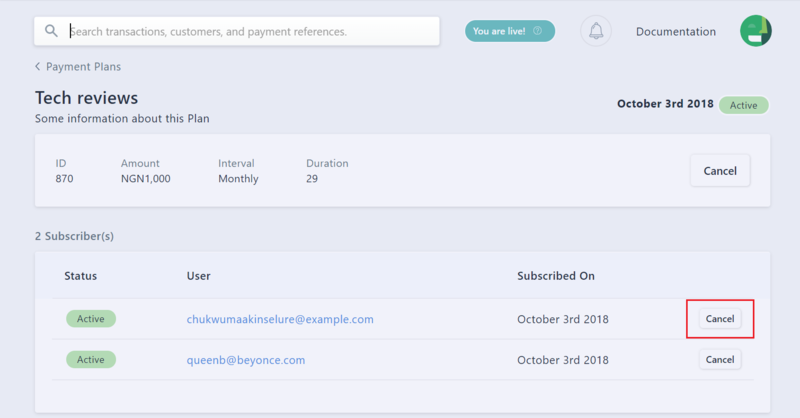 It gives you the option to create a payment plan, see all customers subscribed to a plan, and unsubscribe/resubscribe customers to your payment plan(s). You can also deactivate payment plans here. From the payment plans page, click the "Create payment plan" button. In the dialog box that comes up, fill in the details for the payment plan. Click "Create plan" to finish. Your customers can then be subscribed to this plan by making payments on your website or app. 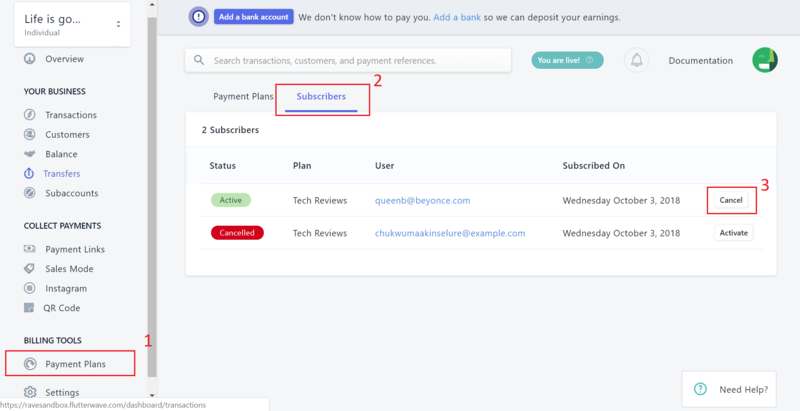 See our documentation for more details on how to subscribe customers to payment plans. To see the details of a plan, click on the plan in the payment plans page. This will show the details of the plan, including the customers that have subscribed to this plan. Sometimes customers want to opt out of their subscription. 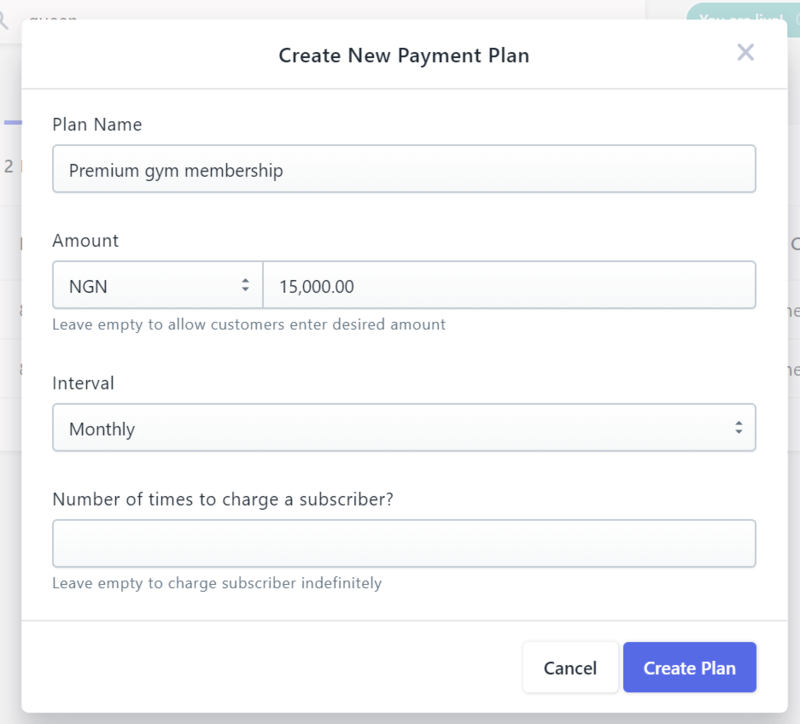 To do this from the dashboard, simply select the specific plan to show the customers subscribed to that plan. Click the cancel button to the right of the customers details. 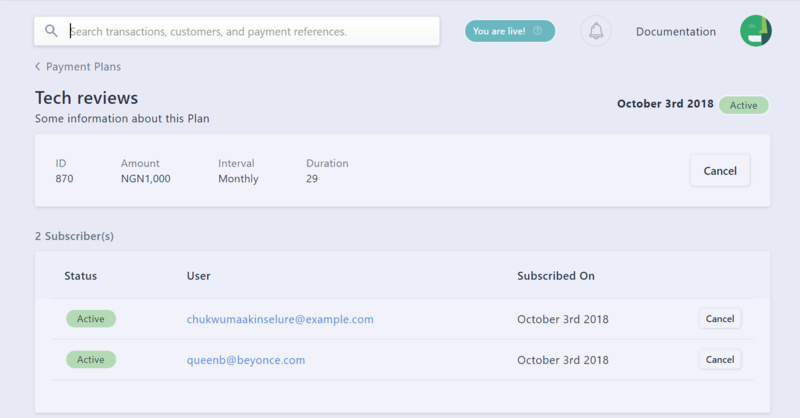 Alternatively, you can also view details of all the customers that have subscribed to plans for your Rave account in the "Subscribers" tab (2) and cancel subscriptions from there (3). The customer will no be charged subsequently, unless you reactivate the subscription (using the same button used to cancel the subscription).